Plans for the trip began last spring when the Office of International Programs teamed up with the Office of Admissions to identify top applicants who might be interested in studying abroad. 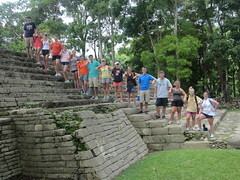 Students earned two credit hours in international sustainability on the weeklong trip, which included lectures at the University of Belize on the history, people and government and on natural resources and land use; a visit to a citrus-produce facility where orange juice is made; a tour of a Mayan ruin and village; and a trip to a barrier island where they learned about the tourism industry. Belize is an English-speaking country that was once a British colony. It has a diversity of peoples and cultures, such as Mayans, Spanish, Creoles and Garifuna, descendants of escaped slaves and native Indians. The landscape varies from tropical rainforests to coastal areas with coral reefs. Many teachable moments also occurred apart from the planned topics. Gillespie will lead another group of pre-freshmen next summer to either Belize or Mexico. High school honor students interested in the trip can contact Deborah Weiss, Auburn Abroad assistant director, at weissds@auburn.edu. Current Auburn students also can contact Weiss about study abroad opportunities. “My goal is to get all students to go abroad and to change their view on life and to change them as students,” Gillespie said.